This is an original UK Stereo pressing in very nice overall condition! It has a front laminated flipback sleeve which has a large "Stereo" on the front. It comes with its original polythene-lined "EMI" company inner sleeve. The record is pressed on thick vinyl & has white & gold "HMV" labels. It has 1st press 2YEA 192-6 and 2YEA 193-12 matrix numbers. 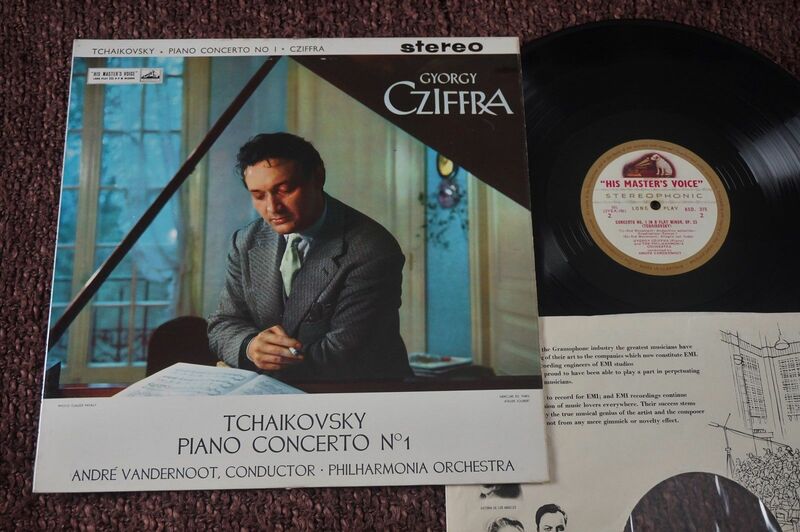 I have some other rare UK Classical LP's for sale too. So please see my other listings. Sleeve: Very nice! There is some light fading & light foxing on the rear sleeve. There is a light bit of rubbing wear to the bottom edge too. VG++ condition. Vinyl: There are some light to mild sleeve rubs can be seen under a strong light. There is also a minor warp. It hardly notices & does not affect playback. VG+ condition. I have play tested this LP in its entirety & it plays VG to VG+ overall. There is some light, very light or very mild crackle which is noticeable in the quieter places. There are no clicks or pops. The labels are in excellent+ condition and show minimal spindle wear. The company inner sleeve is in VG+ condition. There is some light to mild ringwear & creasing. There are no seam splits. >> Grading Information All grading is very strict & adheres to 'Record Collector' specifications. However, I have fine tuned them & they are explained below. All vinyl is examined closely under a strong light & play tested. NEAR MINT Condition = Very nearly mint just slightly under, maybe a couple of very, very light paper sleeve scuffs that can only be seen under strong light. SOME WOULD CLASS THIS AS MINT. This disc has been played a couple of times at most. Cover is virtually perfect - very minimal wear only. EX Condition = A clean & tidy copy that shows virtually no defects. Maybe one or two light needle scuffs or light sleeve removal marks that can only be seen under strong light. There will be no scratches. Play will be near perfect with no distortion. Cover will be very nice with maybe very minimal creasing, ringwear or edgewear. AN INVOICE WILL BE SENT TO YOU VERY SOON AFTER THE AUCTION ENDS. PLEASE WAIT FOR THIS BEFORE PAYING. 7" single = £2.25 add another £1.00 (optional up to £20) for insurance. This is for standard registered items. All insurance must cover the value of the item. Therefore, for expensive items (£70+), Royal Mail "Special Delivery" will be used. This will be an extra £5.00. LP album = £4.50 add another £1.00 (optional up to £20) for insurance. This is for standard registered items. All insurance must cover the value of the item. Therefore, for expensive items (£70+), Royal Mail "Special Delivery" will be used. This will be an extra £6.00. IF THE FINAL PRICE OF AN ITEM(S) EXCEEDS £20.00 GBP THEN INSURANCE WILL BECOME MANDATORY. PLEASE NOTE THAT YOU ONLY PAY FOR INSURANCE ONCE. IT IS THE SAME COST REGARDLESS OF PACKAGE WEIGHT. SO YOU CAN ORDER MORE ITEMS & PAY NO MORE FOR INSURANCE! DISCOUNT WILL BE GIVEN ON POSTAGE FOR MULTIPLE ITEMS. SEE PRICES ABOVE. Please note that these prices are as a general guideline only. For example: Double LPs are classed as two LPs. Also posters, inserts, etc.. can increase postage costs. One parcel must not exceed 2kg (approximately 4-6 LPS). All records will be sent in high quality vinyl mailers with at least two card stiffeners either side of the LP or 7". I use a cruciform box for larger orders (4-6 LPs). All parcels will be marked "Fragile" and dispatch time will generally be between 1-3 days after payment. I will also remove the vinyl from the sleeve & place them in a re-sealable polythene sleeve. In order to prevent seam splits. Depending on the inner sleeve; I often remove the vinyl from the inner sleeve & place it in a separate plain paper, or polythene-lined, plain inner sleeve. I am very conscientious and careful when packaging your LP(s). Sorry, I only accept Paypal, or money sent in a registered letter from overseas buyers. Please note that I cannot reimburse payments for any uninsured items lost in the post. Sorry! If you are uncertain about any of the above, or just simply want some information regarding any item, please do not hesitate to contact me. I welcome any questions. Remember to check out My Other Items Lots of rare & quality vinyl! Most are UK 1st Pressings. It is quite likely that there will be more records by this artist, or records in a similar vein.